As the Houston winter turned to spring conversations turned to the MS 150. The main event of the year for many in the Six Thirty group. There was an expectation that you were riding the MS150. What could possibly stop you? The MS 150 is a two-day ride of between 150 mi / 240 km and 180 mi / 290 km, depending on which of the three starting points you choose in Houston. Day One ends at the Fayette County Fairgrounds in La Grange. The final destination is next to the Texas State Capitol in Austin. The purpose of the ride is to raise money for multiple sclerosis research and other services supported by the National MS Society. 75 mi / 120 km was well beyond my longest ever ride. My first challenge was to convince myself that I could ride that far. So I rode the events that were billed as MS 150 training rides, like the Gator Ride in March. I huffed up the climbs at Cat Spring, Chappell Hill and Bellville, hoping that I would be adequately prepared for the mythic hills of Austin. By March I felt I probably had enough miles and climbs in my legs to sign up for the event. I was a very late entrant and was lucky to get a place. The MS 150 is a very popular ride and the 13,000 places get snapped up very quickly every year. I was, it seemed, a beneficiary of the appalling weather that plagued the 2009 ride. Day One had been cancelled and the rain, wind and cold made Day Two miserable for the riders. Some of whom had decided not to sign up for the 2010 event. Leaving spots available for latecomers like myself. Once I had my place in the event there were two things to do. One was to raise the minimum fundraising pledge. I had left myself very little time to hit up my friends for donations. Most of whom were looking for their own donors anyway. The solution was simple. My biker chick and I split the required amount between us. The second task was to find a team to ride with. The obvious choice was my employer, but the Hess Corporation team was full. Tom B. came through for me, again, and managed to get me a last-minute spot on the Exxon Mobil team with him. I was so late that I had missed the deadline for ordering a team jersey. Not such a bad thing in hindsight. I don’t think it would have done me much good to be seen in an Exxon Mobil jersey by the great and the good of Hess Corporation. As the big day drew closer I continued to worry about never having ridden 75 mi / 120 km before. So the weekend before the MS 150 I rode in The Space Race. A loop from Gulf Greyhound Park in La Marque through the Brazoria National Wildlife Refuge to the west, then north to the outskirts of Angleton before heading eastward toward Alvin and back to La Marque. I felt good at the halfway point. I felt really terrible with 20 mi / 32 km to go. I was hot and tired and hungry and barely maintaining forward progress into a constant headwind. The event was billed as a 100 mi / 160 km ride. I was so thankful that the finish came sooner than advertised. I didn’t get my first century ride under my belt that day. But more importantly I did come away convinced that I could finish the MS 150. Even if it almost killed me! A group of Six Thirtyers rolled out of Jack Rhodes Memorial Stadium in Katy at dawn. It would take far too many words to describe the energy, the excitement, the exuberance, the entertainment and the exhilaration of the next two days. This is one of those events where you truly had to be there. In Bellville and Fayetteville and La Grange and Bastrop and Austin there were crowds lining the streets ringing cowbells, blowing bubbles, waving signs, cheering, tooting horns, shouting “thank you.” We even had live music. A fiddle band at one point. A bagpiper in full regalia at another. There were brigades of cheerful volunteers at every rest stop. The familiar faces of the West End Bicycle guys at their bike service tent in Industry. Everyone encouraging us on with a friendly wave and a smile. This is some of the Six Thirty group at the lunch stop at Bellville on Day One. There were five of us in Exxon Mobil jerseys. Only one of us was actually an employee of that company. On Day Two we all put on our Six Thirty jerseys. It has become a tradition that the group foregoes the Bastrop lunch stop sandwiches provided by the MS 150 organizers for the much tastier fare at Whataburger. Texas’ own burger chain. After our burgers, fries and shakes it was 32 mi / 51 km to the finish line in Austin. Where Tom and I naturally had to pose in front of the Texas State Capitol building for the signature glory shot. I knew right there that I would do this ride again in 2011. What I didn’t know right there was that the experience in 2011 would be even better. Posted in Cycling in Texas and tagged Austin, Gator Ride, Houston, MS 150, Six Thirty, Space Race, Whataburger. Bookmark the permalink. The West End Bicycles Six Thirty group in Houston has Ted’s Taco Ride. 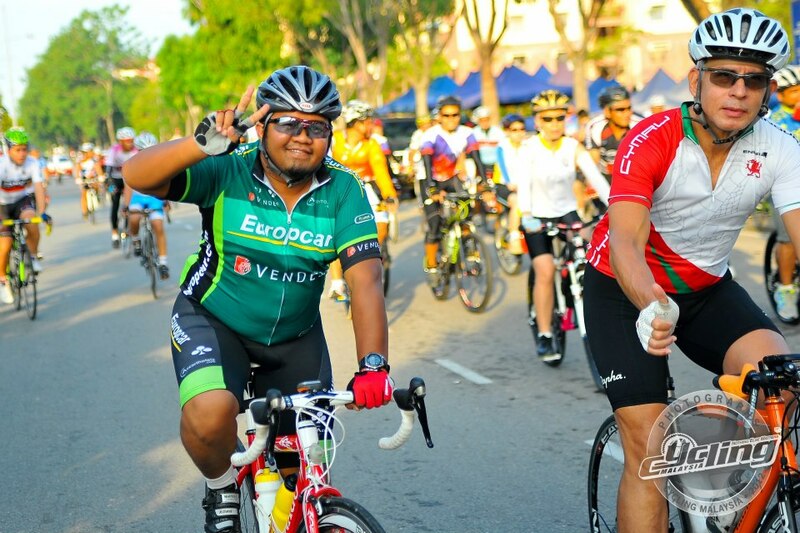 Mark’s Nasi Lemak Ride could become the equivalent for the Racun Cycling Gang in Kuala Lumpur. Roti canai and teh tarik have made frequent appearances in my posts. This is the first time I have mentioned nasi lemak. 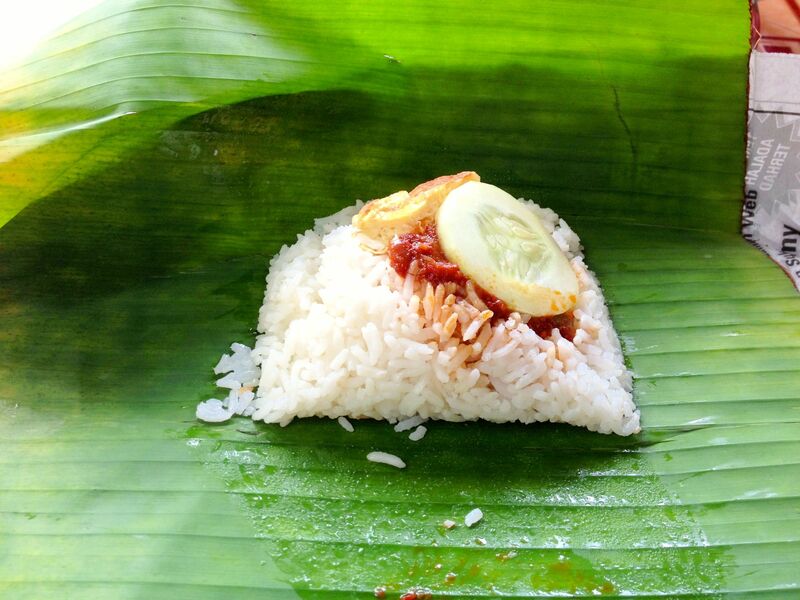 Nasi lemak is another quintessential Malaysian dish. Best described by a good friend of mine, Azlan Zahari Zahid, who writes a blog titled The Nasi Lemak Journal. Click on the link to his blog to read his description of this very popular dish. Mark Lim suggested that we add a ride to the Sungai Congkak Recreational Forest to the end of our round trip from Kampung Batu 18 to the Sungai Tekala Recreational Park. More specifically, to the nasi lemak at Sungai Congkak. Mark, Chon and I set off at 7.15am for Sungai Tekala. Two hours later we were back at Kampung Batu 18 and ready for the main event of the day. After a final 75 meters / 250 feet of climbing we pulled up to an unassuming stall on the bank of a small river. This is what we came for. 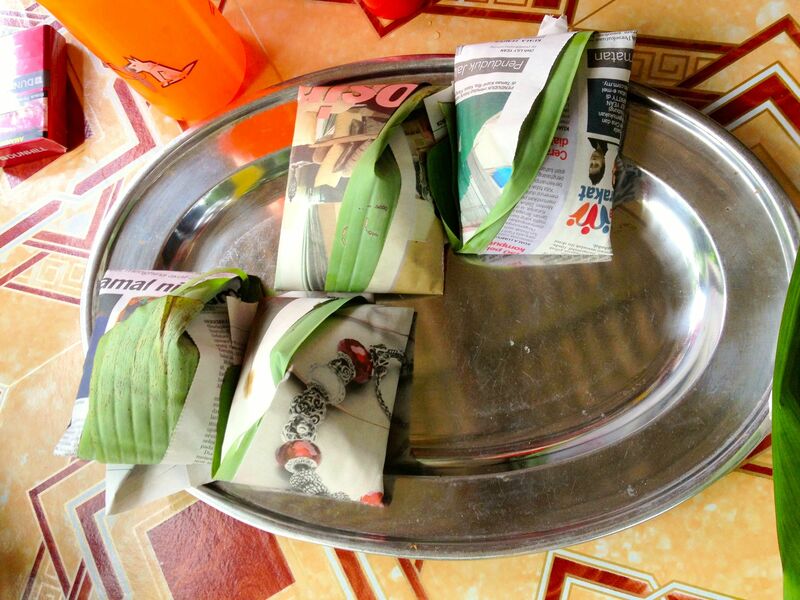 Individual packets of nasi lemak wrapped in banana leaf. The traditional way of serving this dish. Here’s what was inside each packet. A little mound of coconut and pandan flavored rice topped with a sambal made from chillies, onion and dried anchovies, a slice of cucumber and a bit of omelette. Simple and delicious. We demolished two packets each in next to no time. Which turned out to be the last of that batch of nasi lemak. When Marvin and his friend, whom we had met up with toward the end of our ride, arrived a short while later they had a thirty minute wait for the next batch to finish cooking. The stall was relatively cool, nestled as it was at the edge of the jungle and next to a small river. 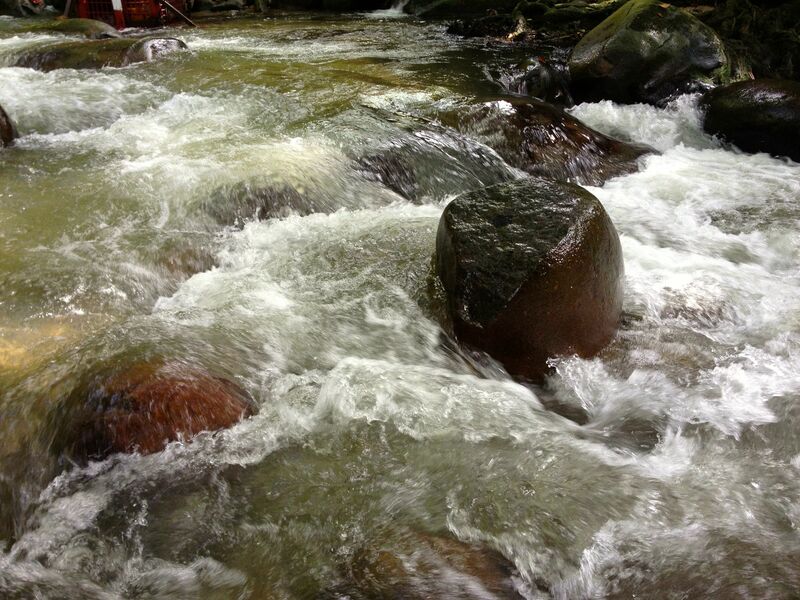 The water made a pleasant roar as it tumbled over the rocks. It turns out that this particular nasi lemak stall is well-known. 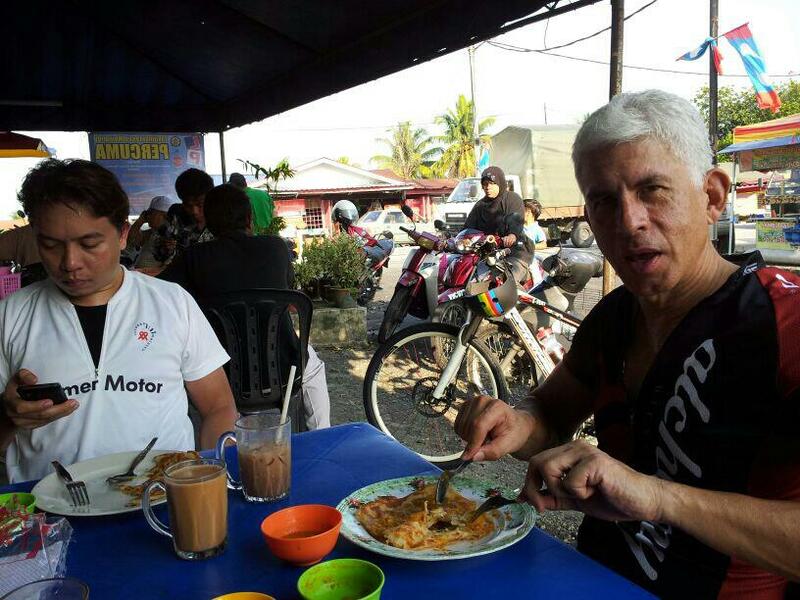 The proprietor Haji Ramli Maon and his wife Rosnah Zakaria have been serving one of Malaysia’s favorite breakfast meals to cyclists and non-cyclists alike for more than fifteen years. A stream of whom had turned up on bikes and in cars as we sat there. Marvin and his friend got their nasi lemak, piping hot and fragrant, fresh out of the pot. They agreed it was worth the wait. Mark, Chon and I had a third packet each. We couldn’t resist. Especially when a packet costs only RM 1 / USD 0.33. My somewwhat excessive breakfast of three packets of nasi lemak and two teh tariks cost the princely sum of RM 6 / USD 2. I paid the equivalent of fifty nasi lemaks to the guy who came by selling bottles of jungle honey. If he is to be believed that honey is a miracle cure for most any ailment. Mark has already tried some of his. He confirms his thumbs up rating for the honey. Chon (left) and Mark, jungle honey and teh tariks. I give the whole morning a thumbs up. I don’t think this will be the last Mark’s Nasi Lemak Ride. Posted in Cycling in Malaysia and tagged Houston, Kuala Lumpur, Nasi Lemak, Racun Cycling Gang, Six Thirty, Sungai Congkak, Sungai Tekala, Ted's Taco Ride, Teh Tarik. Bookmark the permalink. My biker chick and I had just a few requirements while shortlisting apartments in Kuala Lumpur. Easy access to the Light Rail Transit system so we can avoid the traffic jams. A guest room for all our friends who have promised to visit us. A study for work and online shopping. And space for two bicycles, a workbench, a work stand, and shelves to hold helmets, lights, gloves, spare tubes, and the rest of my cycling paraphernalia. I was spoiled in Den Haag. 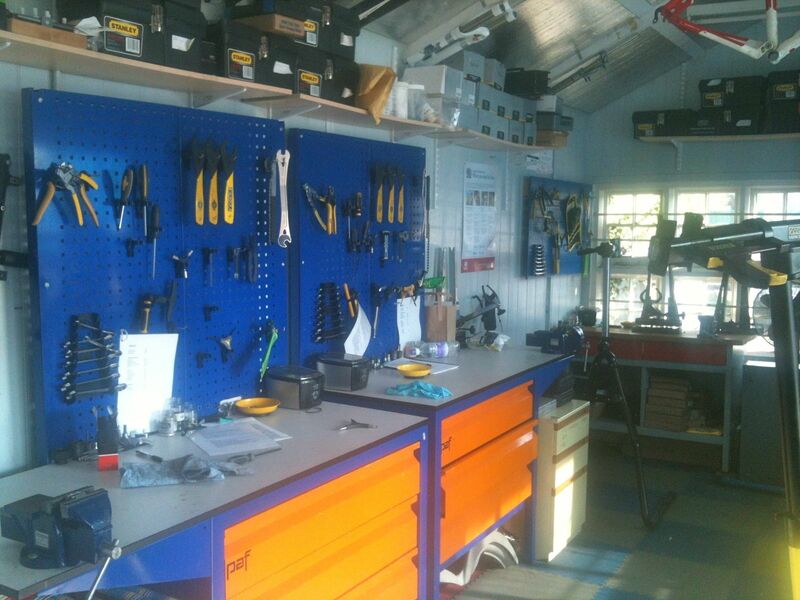 We had a basement utility room that easily doubled as a store room and bicycle workshop. It quickly became apparent that I would not have the luxury of that much space in Kuala Lumpur. Unless I took over one of the bedrooms. Which might have meant living on my own. The apartments in Kuala Lumpur on our shortlist all had maid’s rooms that could become bicycle rooms. They all had small maid’s rooms that could become small bicycle rooms. I have 6 square feet at my disposal. Once I got my workbench and shelves into the maid’s room I was left with 4 square feet. That isn’t enough space to have both bikes and myself in the room at the same time. So for a while I would wheel one bike outside when I wanted to work at the bench. Biker chick suggested that I rack one bike above the other, and also suggested what to use to do that. Smart girl. We once had an IKEA Stolmen system in our bedroom. She suggested using two posts and some hooks to hang one bike above the other. That is a great solution because the posts telescope to fit a range of ceiling heights, and the hooks can be mounted anywhere on the posts. Another big advantage is the posts do not need to be bolted to the floor and the ceiling so installation is very easy. The hardest part of the installation turned out to be sliding pieces of old inner tube onto the hooks. 700 x 23c inner tubes are a very tight fit on Stolmen hooks. Dishwashing liquid and some elbow grease did the trick. 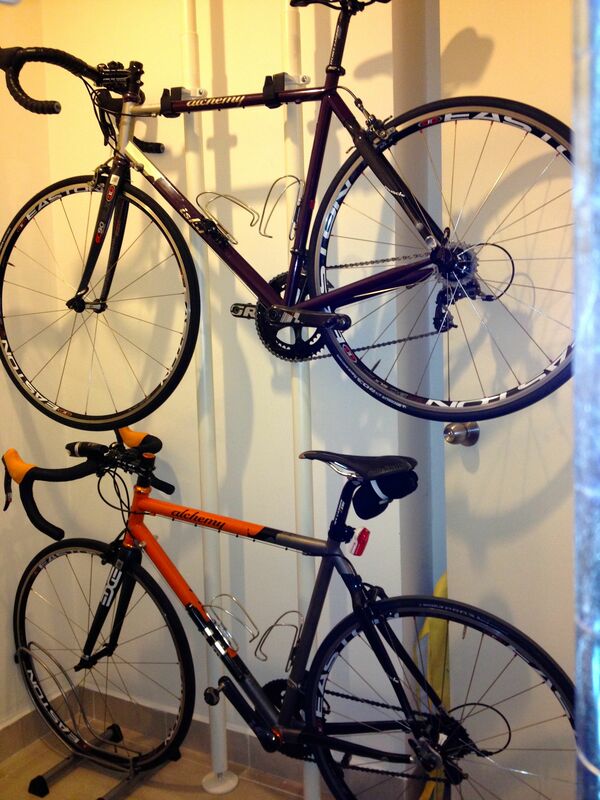 Now I have one bike in a stand against the wall, and another suspended above it on non-scratching hooks. It isn’t the cheapest solution but it is quite elegant. And portable, in case our next move is to somewhere with a similarly small bike space. Posted in Cycling in Malaysia and tagged Apartment, IKEA, Kuala Lumpur, Stolmen. Bookmark the permalink. The Racun Cycling Gang does regular rides through Putrajaya. Putrajaya is the administrative center of Malaysia, much like Brasilia is for Brazil and Canberra is for Australia. 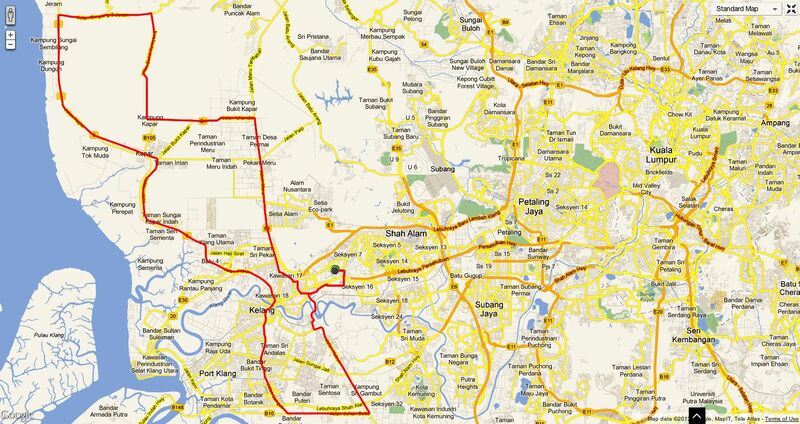 And like those capitals Putrajaya is a planned city, albeit the newest of the three. The seat of government moved from Kuala Lumpur to Putrajaya in 1999. The 32 km2 / 8,000 acre greenfield site presented architects with a blank canvas to cover with buildings and bridges in all manner of of traditional and modern design. 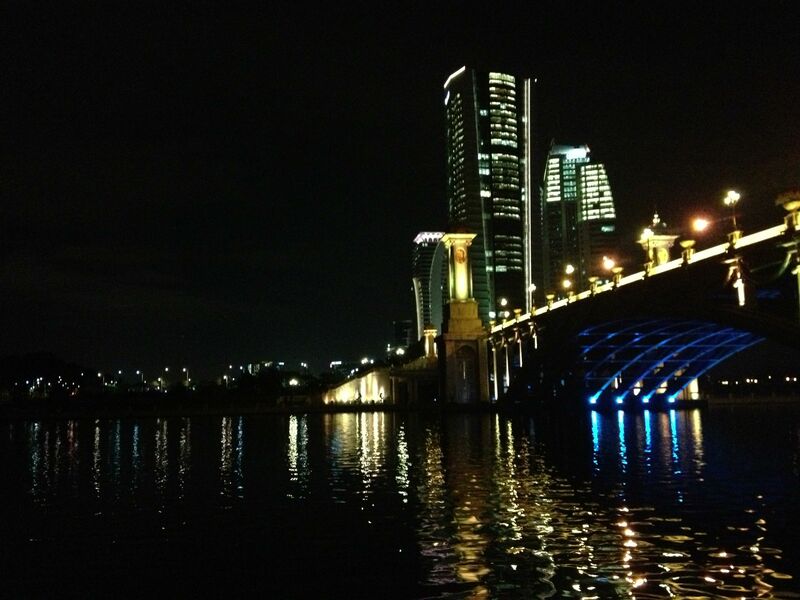 Much of Putrajaya is lit up at night, and the spot and colored lights make the buildings look even more spectacular. Our ride started below the International Convention Centre. Sadly we weren’t allowed to ride up the hill and circle the building. 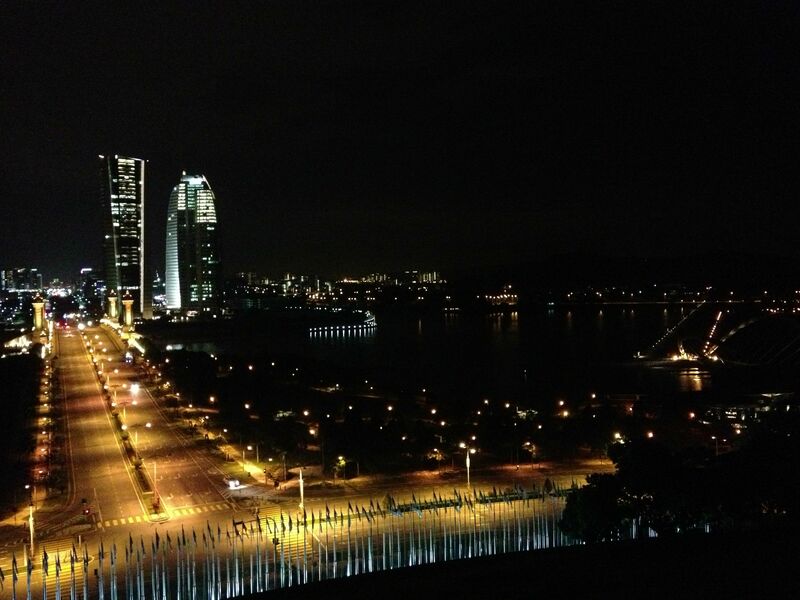 We rolled down the hill from the International Convention Center and rode along the Putrajaya lakefront. 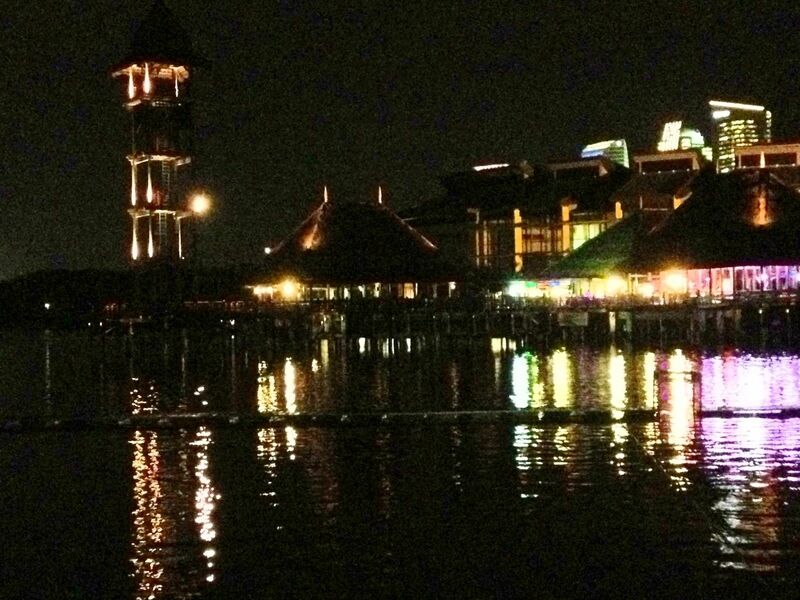 We passed in front of the Pullman Putrajaya Lakeside Hotel. We then crossed the Seri Gemilang bridge toward the Ministry of Housing and Local Government buildings. The next spectacular building we passed was the Energy Commission’s Diamond Building. This is the first office building in the counry to obtain the Green Building Index platinum rating. After the short sharp climb to Wisma Putra or the Ministry of Foreign Affairs we shot back down the hill and covered a roughly semicircular route from east to west. 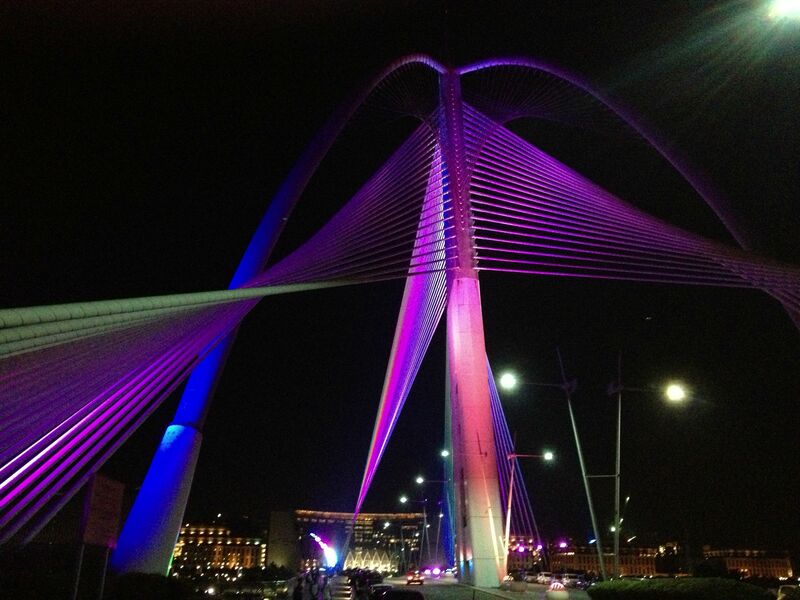 We then turned eastward again across the Seri Wawasan bridge to get to Persiaran Perdana or Perdana Boulevard. Persiaran Perdana runs north-south and is the longest boulevard in Putrajaya. 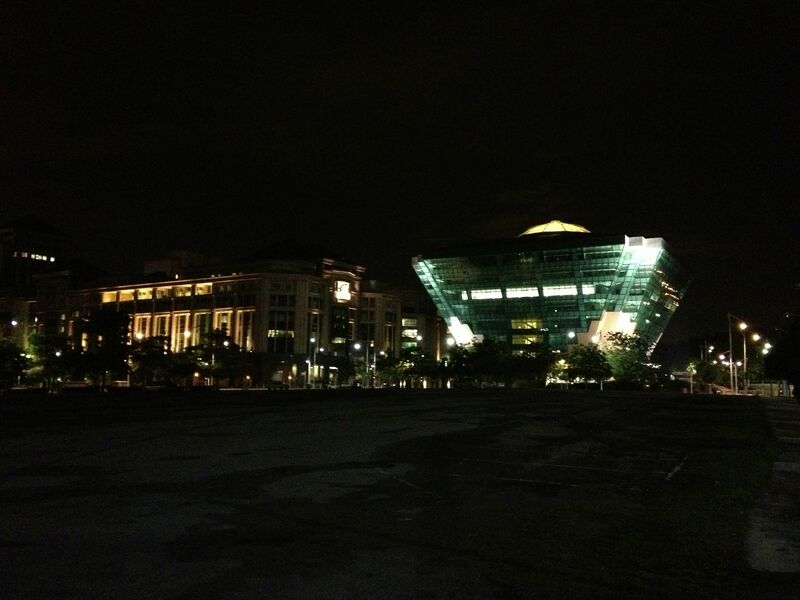 We headed north on Persiaran Perdana to the circular Dataran Putra. 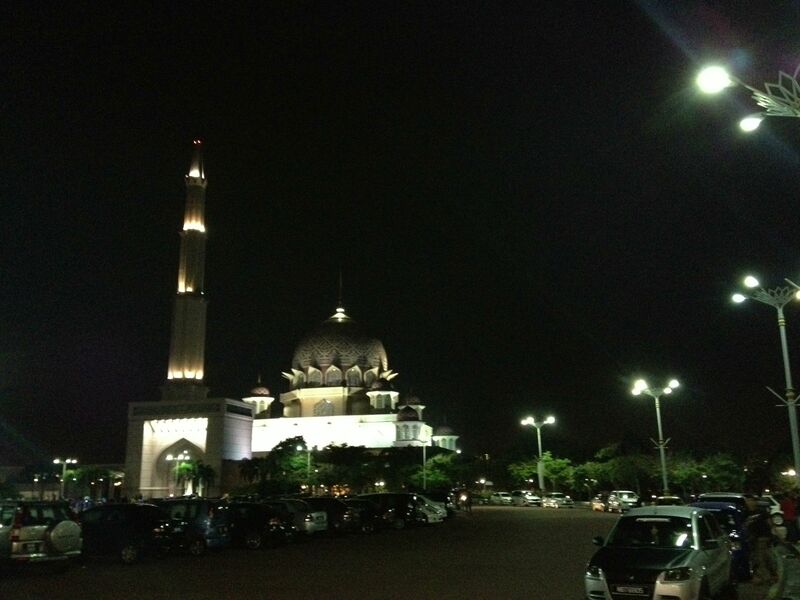 Around the 300 meter circle are the Prime Minister’s office complex, the Putrajaya Souk and the Putra Mosque. From the mosque it was a straight ride southward back across the Seri Gemilang bridge to our starting point below the International Convention Centre. Here is the final look back across the bridge. Posted in Cycling in Malaysia and tagged Night, Putrajaya, Racun Cycling Gang. Bookmark the permalink. I began collecting bike tools the day after I had my first flat tire. To be ready for my next flat tire I bought a Genuine Innovations Ultraflate Plus, some CO2 canisters, inner tubes, a patch kit and a set of Pedro’s tire levers. Blaine G. at West End Bicycles recommended the orange tire levers because they were easier to find if you dropped one in the dark. I also bought a Park Tool MT-1 Multi Tool. Having a multi tool seemed like a good idea, not that I knew what to do with it at the time. I am a DIYer so the need for another tool presented itself often enough. 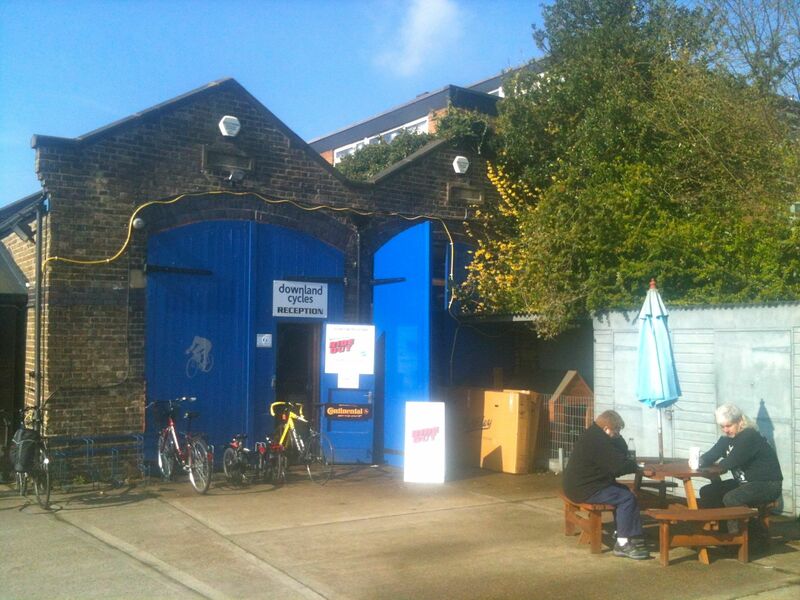 I would then visit West End Bicycles, credit card in hand. I decided it would be a good idea to remove the chain to clean it so I bought a Park Tool chain tool. I needed a hex wrench to change bottle cages. I thought that while I was at it I might as well get a set of Park Tool 3-Way Hex Wrenches. I kept stabbing myself on the sharp ends of the MT-1 multi tool so I picked up a Topeak Toolbar Multi Tool. Who knew that you could never own enough multi tools? My collection of bike tools continued to grow. A pedal wrench. Various screwdrivers. Some bigger ticket items like a Feedback Sports Pro-Classic Work Stand and a Guistaforza torque wrench. I got to the point where I could remove, degrease and replace pedals. I could remove and replace a chain using SRAM Powerlock connectors instead of a chain tool. Does anyone by chance want to buy a lightly used chain tool? I knew about torque settings for various parts like stem bolts and seat post binder bolts. I was able to adjust a rear derailleur. But some jobs were beyond me. Removing a cassette for example. Or disassembling chain rings. I didn’t have the know how to do those things, let alone the tools. So when my two year old steel bike was due for a full service, having carried me about 8,000 km / 5,000 mi, I sent it to Tom Schouten Wielersport in Scheveningen. It felt like a new bike when I got it back. All the cables had been replaced. The hubs, bottom bracket and headset had been cleaned and greased. The wheels had been trued. It had new bar tape. It was cleaner than it had been since the day I took delivery of it. The only downside? It cost me €175 / USD225 / RM685. That got me to thinking that I should be able to do everything that Tom’s shop did. Which is how I ended up at Downland Cycles in Canterbury for their 5 day Bike Maintenance course. Bryan and Martyn take five students at a time and share the instructor’s role. My fellow course mates were Delma E., Chris D, Ralph S. and Dave S. This is Delma and Chris on a lunch break outside the retail shop. The course is run in Downland’s e training center next to the retail shop. 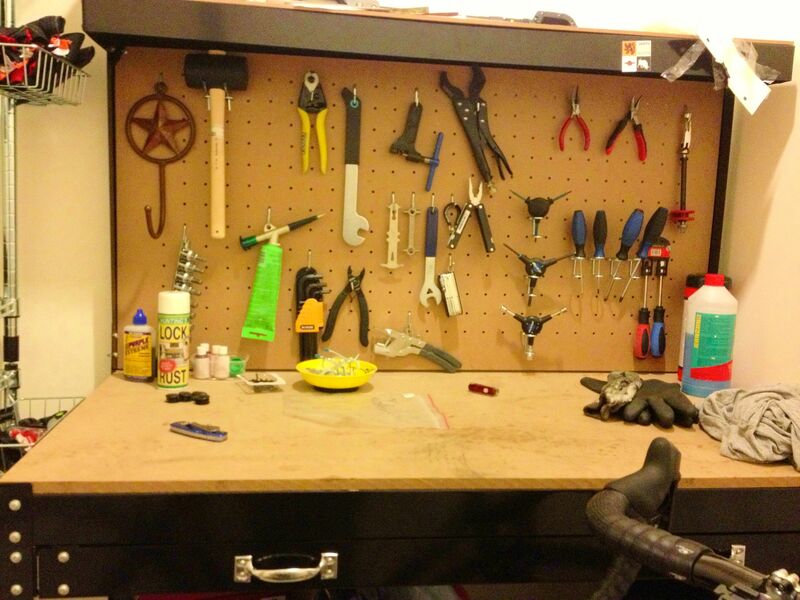 We each had a fully-equipped work bench and work stand. There were tools on that work bench that I didn’t recognize, let alone know how to use. A particularly mysterious item on our work benches was this. You can opt to bring your own bicycle to work on during the course. Bryan and Martyn must trust their teaching abilities enough to be confident that a student will leave with their bike in better working condition than it was upon arrival. Chris and I had flown to London, so we didn’t bring our bikes. Neither had Delma nor Ralph. Dave rode his bike to Downland’s every morning. Bryan and Martyn were excellent teachers. The course was comprehensive and covered road and mountain bike maintenance. We even had a session on wheel building and truing. We all learned a lot. Including the fact that the bicycle maintenance universe is divided into the Shimano and SRAM galaxy and the Campagnolo galaxy. We lost count of the number of times Bryan and Martyn said something along the lines of “This is how you remove Shimano and SRAM cranks, but not Campagnolo,” or “This is the tool you use to remove a Shimano or SRAM cassette lock ring, but not Campagnolo.” It quickly became apparent that a full-service shop needed two sets of tools. One set for most bikes and one set for Campagnolo. We spent a lot of time ensuring that bolts were tightened to the proper torque. This is particularly important with carbon parts, which will crack if bolts are overtightened. Dave had to unlearn the habit he developed while working on motorbikes. Which was his “Full Muller” approach to tightening bolts. That is to say, tighten until you can’t tighten anymore. We all gave it the Full Muller over the five days. There was a lot to take in to be ready to face the Friday challenge. Which was to completely strip a bike down, including removing the fork, disassemble the chain rings etc., clean and lubricate all the parts, replace cables as required, reassemble the bike, adjust the shifting and brakes, and do a systematic safety check of the bike when we were finished. Dave even replaced a part or two on his bike and rode away that evening on a testament to his newly acquired wrenching skills. I do most of the maintenance work on my bikes myself now. Which of course means that I own even more tools. So many that I needed to get a workbench with a peg board for them. And a shelf for the ultrasonic cleaner. And a drawer for the Syntace Torque Tool 10-80. Which I need to ensure that I don’t “give it the Full Muller” and ruin a bottom bracket cup or a crank bolt. 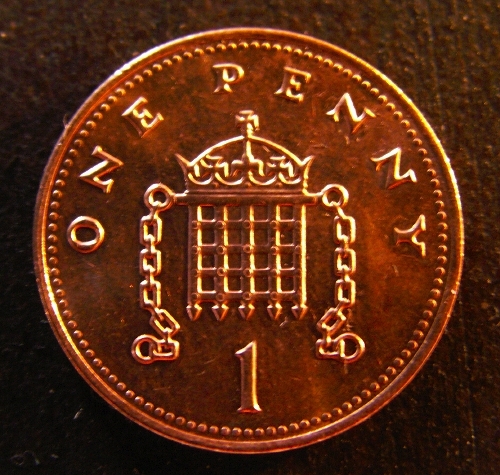 And what of the British one penny coin? It turns out that the coin is 2 mm thick. The perfect tool for measuring the correct gap between the chain and the inner cage plate of a front derailleur. Posted in Cycling in Malaysia and tagged Campagnolo, Downland Cycles, Maintenance, Shimano, SRAM, Tom Schouten Wielersport, Tools. Bookmark the permalink. Eat to Ride, or Ride to Eat? I learned the hard way that avoiding the bonk, or going hypoglycemic, on a challenging event, requires that I eat to ride. Both before and during the ride. Fortunately I don’t do many rides that require eating on the bike. An activity that demands enough confidence, or stupidity if the roads are bad, to take your hands off the handlebar, sufficient dexterity to fish around behind your back to find your energy bar or gel or whatever, and gills so that you can continue to breathe while chewing and swallowing. All the while pedaling so you won’t get dropped. It is much more fun, civilized even, to ride to eat. Houston’s West End Bicycles Six Thirty group introduced me to the delightful practice of riding as an excuse to eat. After our Thursday evening rides we would gather at Jax Grill or Romano’s Pizza to “replenish our glycogen stores.” I have already written about the mid-ride breakfasts at Dona Maria which give Ted’s Taco Ride its name. Good company, a bit of exercise, good food and lots of laughter. What a winning hand! So it was “hip hip hooray” when I discovered that Den Haag’s the Not Possibles end their Saturday morning rides at the Coffee Club in Leidsenhage. Appeltaart and the occasional uitsmijter are the foods of choice in Den Haag. We have been known to linger over a second koffie verkeerd, purely for health reasons of course! Malaysians live to eat. That is indisputable. So naturally every ride here involves eating. Either mid-ride, or after the ride, or both. Even the rides that require you to eat to ride, like the Broga 116, end with food of some description provided by the organizers. 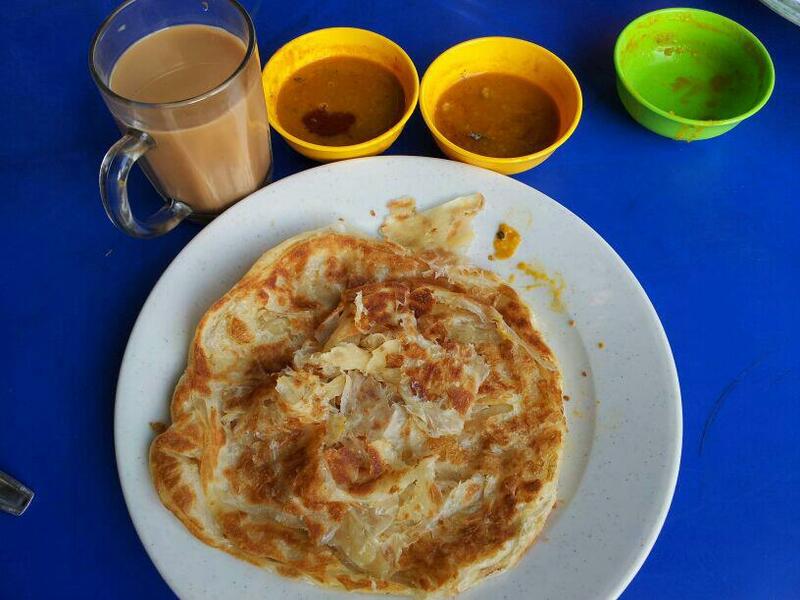 The meal of choice for the Racun Cycling Gang and the Cyclistis is often the humble roti canai. With a teh tarik to wash it down with. The best roti canai are crispy on the outside and soft on the inside. Everyone who has ever had one wants another. And another. And another. This was during a ride to Kundang. 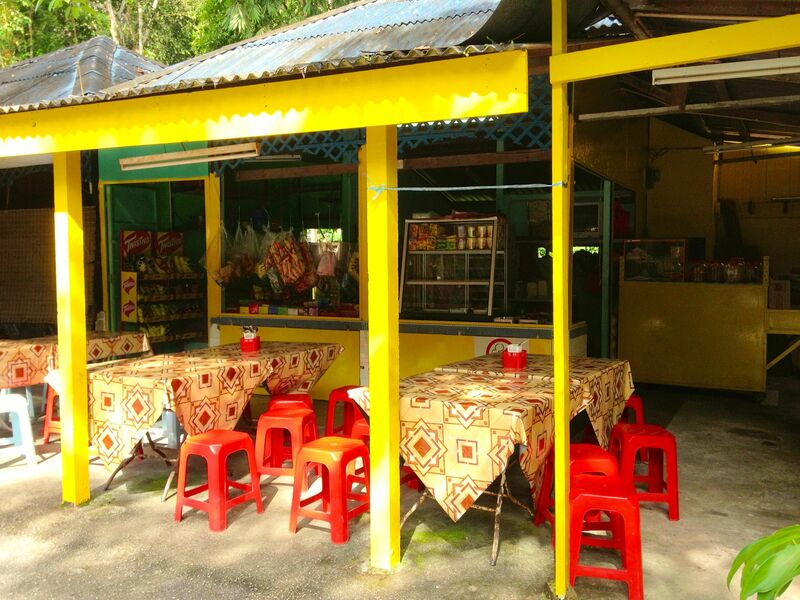 Specifically to eat some roti canai at this roadside stall. Shahfiq is taking an e-break. I am starting on my second roti. The eating is only part of the experience. Watching your roti canai being made is entertaining too. Which you can do now too, courtesy of this video by Mark Wiens from his blog Migrationology. As a bonus you will see teh tarik, the quintessential drink to go with your roti, being made. I’ve been looking through Mark’s blog as I wrote this post. His write ups and photos are making me hungry. Good thing there is a ride this evening. I need an excuse to eat a roti canai or two. Posted in Cycling in Malaysia, Cycling in Texas, Cycling in the Netherlands and tagged Dona Maria, Jax Grill, Migrationology, Roti canai, Six Thirty, Teh Tarik, The Not Possibles, West End Bicycles. Bookmark the permalink. After last weekend’s Broga broiler my biker chick gave me strict instructions. I was to get a full medical examination before doing any more hot and humid rides. Which in Kuala Lumpur meant before doing any more rides – period. Turning 55 was additional incentive, not that I needed it given that my cycling was at risk, to get checked out. So I spent a few hours being been scanned, prodded, pierced, x-rayed and wired to various machines. I was declared fully fit so I was able to turn my attention to what rides to do over the coming weekend. A group from the Racun Cycling Gang and some Cyclistis had signed up for this ride: a charity ride in support of the Malaysian Aids Foundation. By the time I got my act together registration for this ride had closed. Fortunately, or perhaps unfortunately given the weather forecast for the day of the ride, the organisers accepted my entry despite my tardiness. The ride was 130 km. There was one water stop, at the 80 km point. The organisers recommended that riders have two, or better yet, three bottles to get them to the water stop. I had three bottles on the Broga ride and that hadn’t been enough. I would have to do some things differently to make it through this ride in better shape that I had been during the Broga ride. The first thing to do differently this time would be to not let my heart rate shoot past 150 bpm. The Karvonen formula, which is a more accurate way to calculate your maximum heart rate than the frequently quoted 220 minus your age method, puts my maximum heart rate at 165 bpm. I suspect that part of my troubles during the Broga ride stemmed from riding at greater than 85% of my maximum heart rate for more than an hour, including hitting 165 bpm at a few points. In other words I would have to curb my competitive instincts and not chase after faster riders. The second thing to do differently this time would be to stay as cool as possible. I should have done this very simple and, in hindsight, obvious thing from my first ride in Malaysia. I put my three bottles in the freezer overnight. Farid and I rolled through the start at about 8am. It was already warm and it was obvious that we were in for a sunny morning. You can see two frozen bottles in my cages. The third bottle was in the rear centre pocket of my jersey. Pouring ice cubes down someone’s back was a high school prank. Who would have thought that I would volunteer for the equivalent now? Regular sips of frosty sport drink combined with that lump of ice at the base of my spine kept me lukewarm rather than hot for most of the ride. Despite taking turns at the front of a group that hit better than 40 kph at times I managed to keep my heart rate in check. This was helped in large part by the very flat route. We were riding on the coastal plain to the west of the city, where the only climbing was up highway overpasses. Much like in both Houston and Den Haag. We did approach one climb today but just as we got to the foot of the hill we turned to the right and away from it. I was not disappointed! Of course there is no avoiding the effects of the heat and humidity completely. I was dripping in no time at all. This time I remembered to bring my Sweat GUTR, which I had bought to keep the sweat out of my eyes in the 40° C and higher summer temperatures in Houston. It still works a treat. The water stop had been moved to the 59 km point. 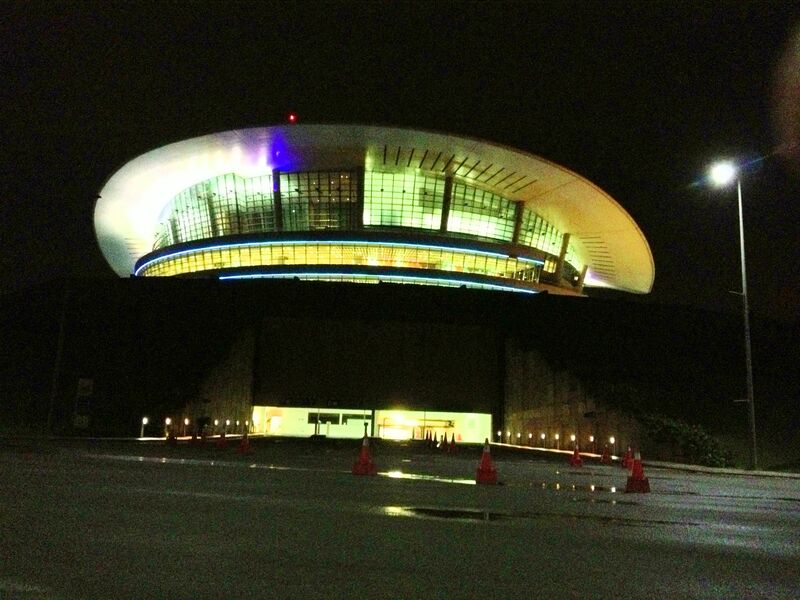 I was glad to see it. I refilled one bottle. I probably should have topped up my other bottles but I didn’t want to dilute the Nuun sport drink. I poured some water over my head and the back of my neck. More to wash the sweat off my face then to cool down. Once we got moving again it did help to have wet hair and a wet jersey. The organizers had shortened the ride to 98 km. I was not disappointed about that either! By the end of the ride all three of my bottles were empty. I rolled across the finish line hot and sweaty and in need of fluid. As you can see there was more to drink at the finish area. It may not look it from the photo above but my strategies to not overheat worked. The freezer is my new friend. Posted in Cycling in Malaysia and tagged Cyclistis, Den Haag, Heat, Houston, Humidity, Racun Cycling Gang. Bookmark the permalink. 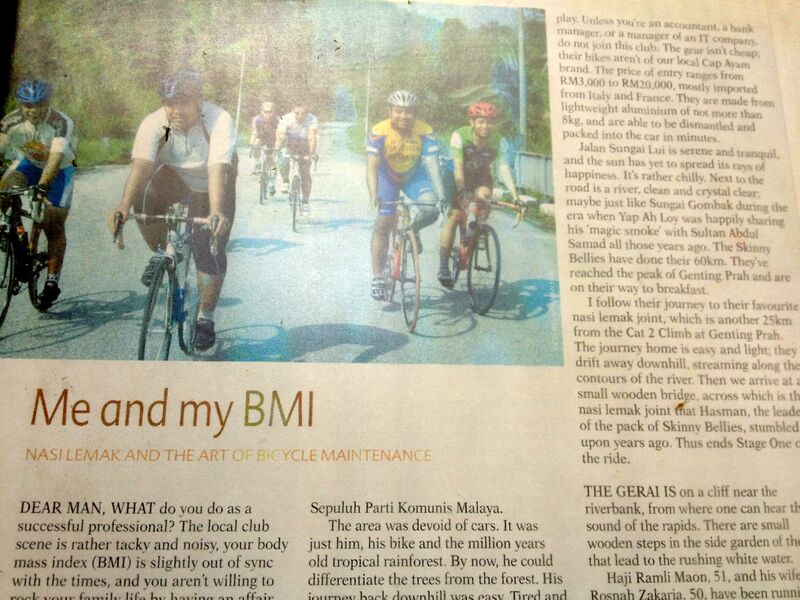 I left Malaysia in 2008 as a non-cyclist. I am back home now with two road bikes and all the paraphernalia that goes with being addicted to cycling. On the Wheel . . .